Fresh on the heels of its last one, VMware has release another Mind Map. This one is geared towards troubleshooting Network issues. Like the previous one I just wrote about yesterday, this one takes you through a series of KB articles to help troubleshoot and resolve network issues with vSphere. I think it’s a great tool for anyone to have and I hope VMware keeps them coming. Link to the Mind Map can be found HERE. 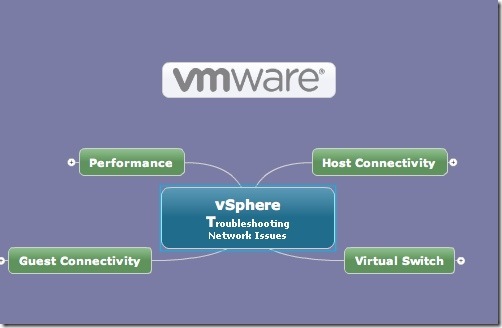 Earlier this week, VMware published the latest version of their interactive troubleshooting guide. The guide is a flash embedded PDF guide that allows you to step through troubleshooting. VMware has dubbed them ‘Resolution Paths’ and I think the whole idea is a great one for admins dealing with issues. While it’s geared about towards newer admins, I think anyone will appreciate any extra tools to help resolve an issues in a faster manner, as well as their bosses. The document contains links to KB articles for the most common issues faced by customers, so while it may not resolve all issues, it definitely gives admins a step in the right direction. 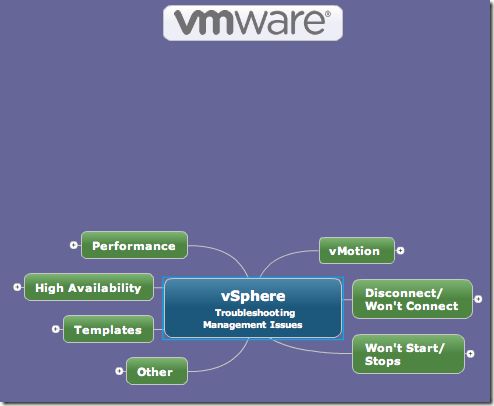 Here is a quick snip from the VMware site about this new Mind Map as well as a sneak peek. We have featured Mind Maps before in this blog and gotten fabulous feedback on them, so we are continuing to develop these using the latest interactive PDF document technology. These new, Flash-embedded PDFs are clickable so that you can expand sections and drill down to the problem you may be experiencing. We’re also trying to make them a little easier on the eyes. Let us know what you think of the new look. Today’s Mind Map details out Resolution Paths for vSphere Management issues. If you recall, a Resolution Path is a collection of KB articles sequenced in a specific order to resolve a specific issue. Since many steps are repeated for different problems, we create separate articles for those steps and reuse them as needed. A link for downloading this document can be found HERE.